President-elect Donald Trump’s decision to speak with Taiwanese President Tsai Ing-wen, making him the first U.S. leader to do so in four decades, is much bigger than a phone chat. We’re literally arming China’s enemy. In reality, though, none of the what Taipei is buying from the U.S. will equip it to invade Beijing. Let’s look at the latest arms deal between the U.S. and Taiwan that took place in December of last year, which is estimated at $1.83 billion. 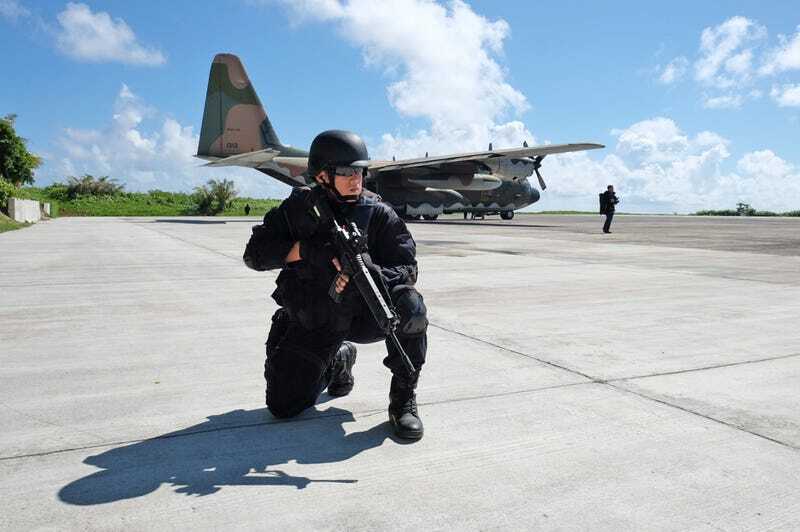 Most of the weapons are defensive in function, which is completely within the guidelines of the Taiwan Relations Act. I know, It seems contradictory for America to enforce the “One China” policy, but sell billions of dollars worth of arms to what China claims is a breakaway region. Here is another way to look at it: China and America are essentially frenemies, if you want to put it the way the kids do. China is a growing world power whose economic and political interests run in sharp contrast with U.S. aims. China’s also seen as a bully to our allies in the region (Vietnam, the Philippines, Malaysia and Brunei) who claim parts of the South China Sea. Consequently, America also sells them arms so that they can defend themselves against an assertive China. More than $5.3 trillion in trade travels through the South China Sea, according to the Council on Foreign Relations. There is no internationally-recognized resolution over which country, exactly, owns what territory in the South China Sea. The military stakes and tensions over what can happen if one nation oversteps are huge for all nations involved. But none of the arms sales to Taipei are the same as calling its leader and legitimizing its leadership. Trump might as well have given Chinese President Xi Jinping the middle finger. That said, though, Taiwan is in no real position to invade China, based on what we sell them. Below is a partial list of what we sold Taipei in December and what each weapon can do, per the Federal Register. The complete list of sales can be found at the Taipei Economic and Cultural Representative Office in the United States. To give some context, these are smaller weapons sales than we do to many other nations. For example, the U.S. also recently approved the sale of F-15QA aircraft worth $21.1 billion to Qatar. It also approved the sale of F/A-18E/F Super Hornet Aircraft worth $10 billion to Kuwait. Both are major offensive hardware sells. As for Taiwan, register links have detailed descriptions of the weapons’ capabilities and details behind the sales. Description: It is a portable one-man armored vehicle and bunker buster that is considered easy to use, according to Raytheon. It has a range of about 2,500 meters. Weapons: The sale, refurbishment, and upgrade of two (2) Oliver Hazard Perry Class Frigates (FFG-7) being provided as Excess Defense Articles (EDA). Each vessel will be equipped with the MK-92 Mod 6 Fire Control System, the SSQ-89V(9) Anti-Submarine Warfare System, the MK-75 76mm Gun System, Phalanx 20mm Close-In-Weapon System (CIWS) (Block l B), MK-13 Guided Missile Launching System (GMLS), AN/SLQ-32 Electronic Warfare System, SPS-49 Start Printed Page 7520 Radar, SQR-19 Towed Array Sonar, SQS-56 Sonar, spare and repair parts, publications and technical documentation, personnel training and training equipment, provisioning, system integration, U.S. Government and contractor logistics, engineering, and technical support services, and other related elements of logistics and program support. Non-major defensive equipment: 20mm dummy rounds; spares to support the installation, maintenance and operation of the MK 15 Phalanx Block l B Baseline 2 systems; classified and unclassified publications; software; training; technical assistance; installations; other technical assistance; and logistical support. The issue with Trump’s call is that President Tsai isn’t as conciliatory to Beijing as her predecessor was. Given how tense issues are between the Washington and Beijing in the South China Sea, the UN and other diplomatic issues, Trump better be prepared to handle any potential fallouts. Update: This post has been updated to clarify the nature of the aircraft sales.